Let It Snow! (OK, maybe not. I've really been enjoying this mild fall we've been experiencing, but it's changing today). There's a new challenge starting today at the Path of Positivity Challenge Blog. Our guest sponsor this month is Bugaboo Stamps, and this month's Path of Positivity theme is 'Festivity'. 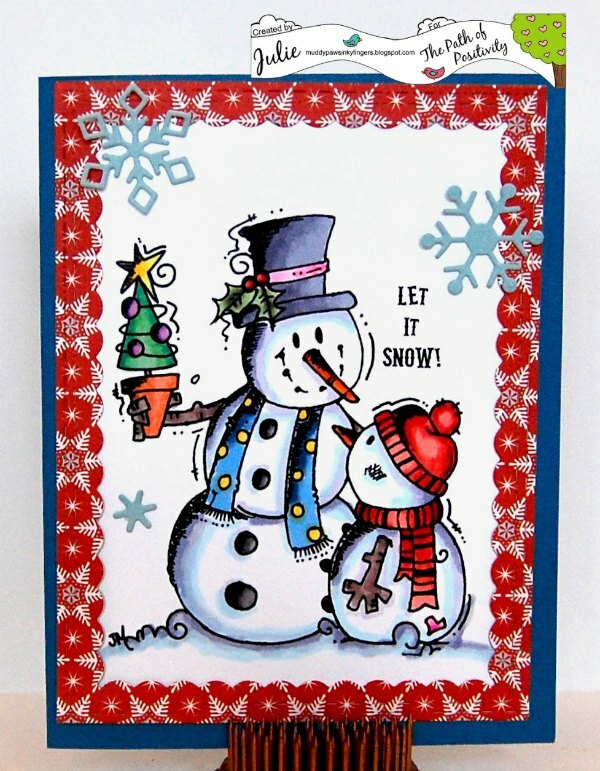 I found these 2 adorable snowmen digi stamps in the Bugaboo store, and thought they'd be so fun to color up, and festive, too. I colored Two Snowmen with Copic markers. The sentiment was computer generated. The frame was cut out with a Lawn Fawn die, using Close To My Heart designer paper. The snowflakes are also Lawn Fawn dies. I hope you can join us this month at Path of Positivity Challenge Blog for our 'Festivity' challenge. You can follow the theme or link up any inspirational project you'd like. Julie, this is gorgeous. You should enter this is the Holiday Chaos Challenge that is going on right now - it would be perfect. that is at Catch the Bug....sorry I wasn't more specific...getting tired. Glad you entered with your adorable card. Thanks for joining us at the Holiday Chaos 2017 Merry and Bright Challenge, Lisa Lynn GDT. Super cute creation. Love those snowmen. Thanks for playing along with us at Catch the Bug for our week-long Holiday Chaos challenges. Good Luck.